3. Bring your vessel containing the water, Potash and Madder Root up to a temperature of 40-45 degrees C. If the pot reaches as high as 50C for a short period, no harm will result. Above that temperature the carbohydrate part of the Alizarin chain will break away, resulting in a less transparent pigment with too much tendency towards brown. Once the pot has reached the recommended temperature, maintain this for the next 36 hours, stirring vigorously from time to time. I suggest at least once a day, more won't hurt. 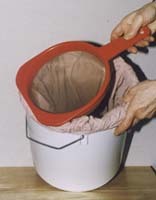 After 36 hours of warming, pour the entire contents into a sieve, which is resting on a bucket that is lined with a fine cotton bag. Study this last sentence carefully. In other words, you want the small bucket lined and secured over the sides, with a fine cotton bag, on top of which you set a sieve. 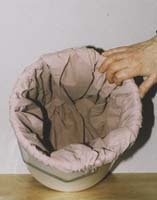 This succeeds in catching the coarse Madder Root and will make the job of straining the liquid through the bag and into the bucket easier.